I actually made these socks a few weeks ago. I googled up a few different patterns, and looked for what people had to say on loom knitting socks. As you can see, it went pretty well. Using a knitting loom only took me a few hours to make one sock. 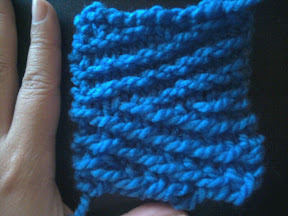 These are not the ideal yarns to use, but I just wanted to see how easy it was to make a sock. 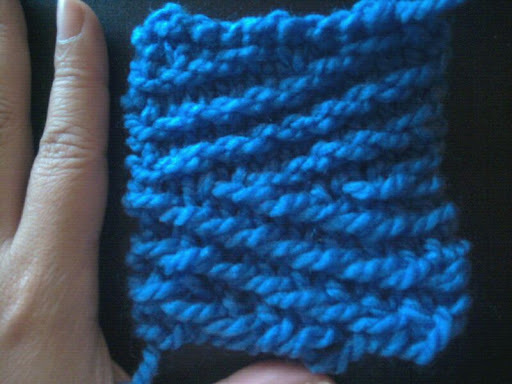 Despite the fact that this is bulky, I can see myself knitting more socks in the future. I don't care what non-loomers say. Socks on looms are RIDICULOUSLY easy. 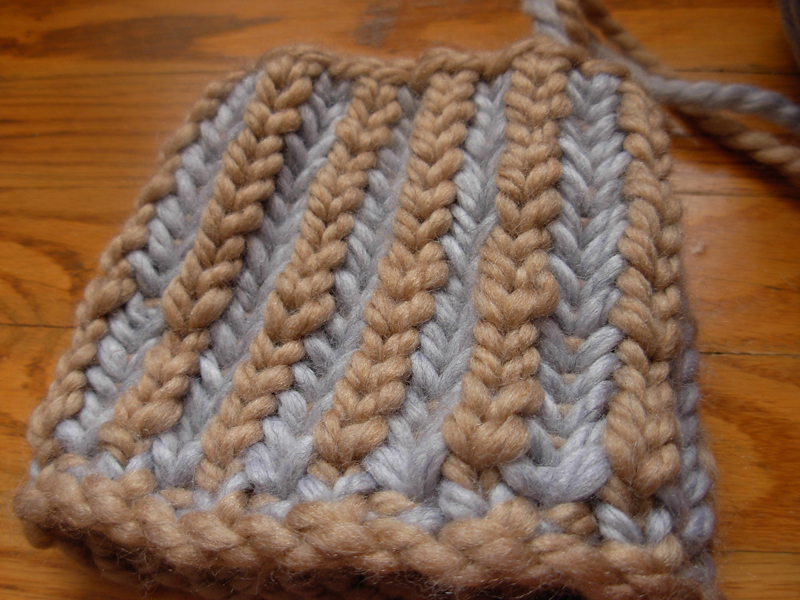 You are knitting in the round, and the only thing you have to learn how to do is short rows, where you knit part of the loom for a few rows before joining them up. 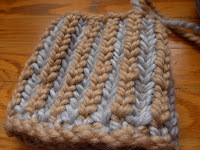 You can use the zig-zag stitch or kitchener stitch to sew up the toe and voila! A sock! Finer gauge looms will look even more amazing, but these looms will save you time rather than knitting with double pointed needles. I actually found this really fun. Scarves can get annoying at times, unless you're double knitting. Also, yes I haven't threaded my work to finish because I'm probably going to frog them to do other stuff/experiments (nothing that has anything to do with hats or headbands, of course). So I've been experimenting with lace lately. Well, no, not lately. I started knitting with needles and crocheting too, but I'm getting ahead of myself. 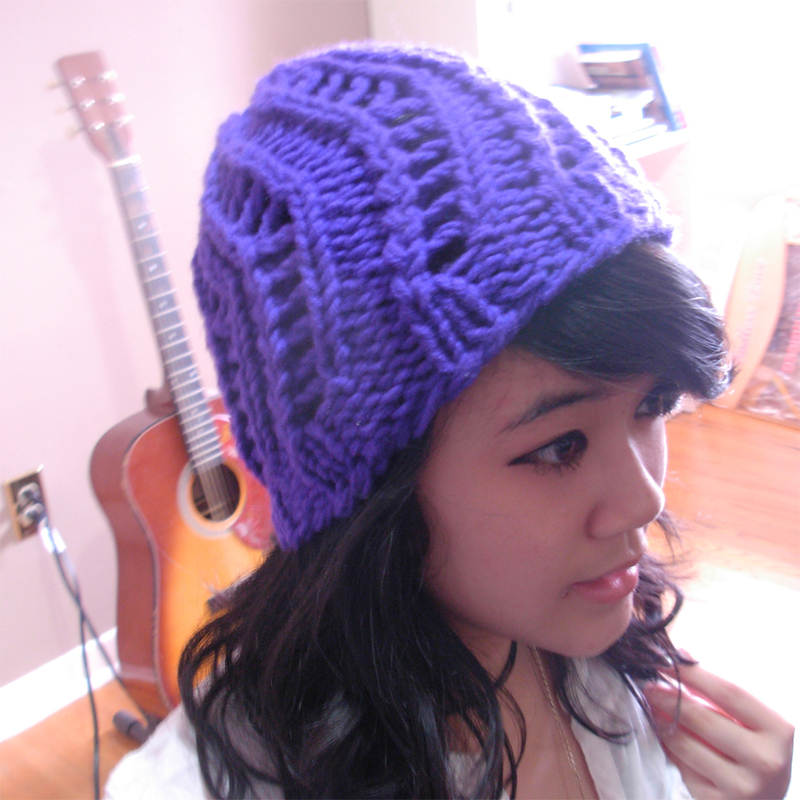 I tried to mention in my last post about getting really nice yarn overs. So here I have a sample of knitting that has a regular yarn over that one would get with needle knitting, and the e-wrap yarn over commonly done in loom knitting. 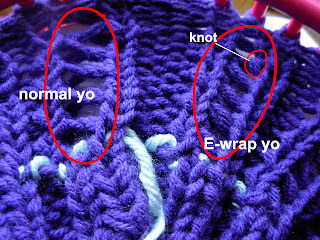 There isn't much of a difference, but I think the e-wrap yarn over looks a little more messy (the knot is at the side, whereas a normal yarn over creates a nice twist) and is slightly smaller when you are making eyelets. 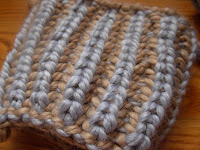 There are reasons why I do my yarn overs that are initially e-wrap instead of just laying the yarn in front of the peg. 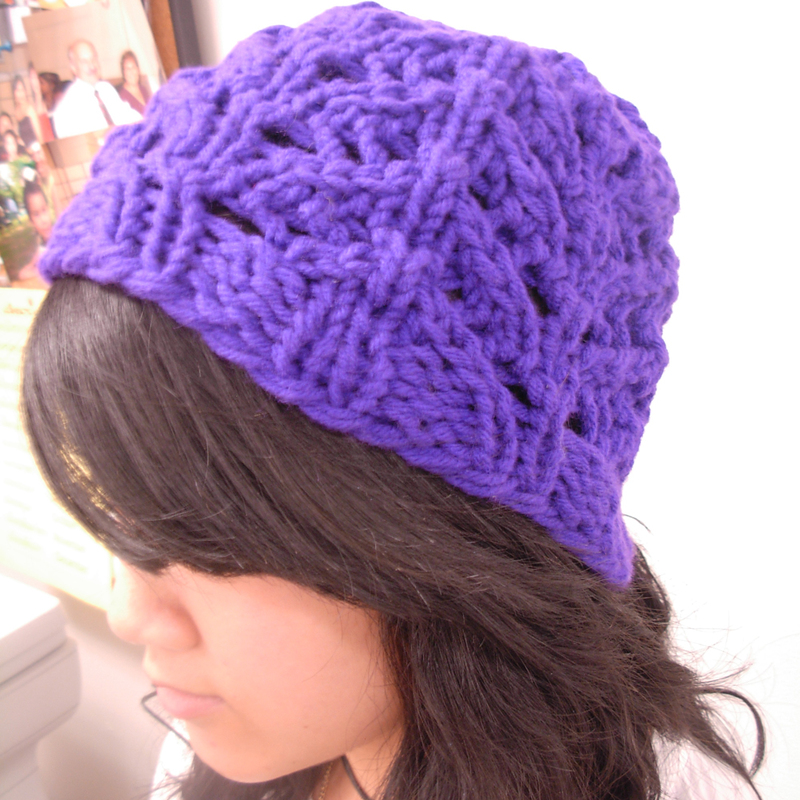 For one, they are loose and easy to knit, whereas just laying the yarn in front of the peg may become too tight. Even if you leave space and do it loosely, the more you knit, the more you pull on the working yarn, so it's easier to just leave it as an e-wrap and unravel it later on. This method provides the cleanest looking eyelets, and it doesn't take long at all! If you want your loom knitting to look like needle knitting, this is it. I hope this tip helps! Proceed onto the pictures for your perusal. I know I have non-English people reading my site (Hiya!) so I will post some pictures soon. I've really been experimenting with lace. I've also found some quick tips that I may be able to post over Easter weekend. Firstly, when you're making eyelets, whether you're doing ssk (decrease to left) or k2tog (decrease to right), and then doing your yarn overs (yo) for lace, the yo is an e-wrap. When they tell you to knit over the peg that you e-wrapped the row before, you should unravel the e-wrap and knit it over like a flat stockinette stitch, I've noticed that if you don't do this, your eyelets don't look like they're knitted together. NOTE: To do sl wyif, slip stitch with yarn in front, lift the peg in which you are supposed to be slipping your stitch, and bring the working yarn behind the peg, and then put your stitch back on the peg. It's a pretty dense pattern, and if anyone needs help, I'll post pics in 2 weeks.